For glory, honor.. and a lot of money seasoned veterans and newcomer must rise to the challenge of the 2016 Hearthstone World Championship. The 16 best players in world clash into each other to fight for the advertised prize money of one million US-Dollars. The biggest Hearthstone tournament of the year will take place at the BlizzCon in Anaheim, California, and four players of each major region – Europe, America, China and Asia-Pacific – are ready to battle for the World Championship title. Thereby the BlizzCon is celebrating its 10-year anniversary, contemporary game developer Blizzard Entertainment is getting 25 years old in 2016 – so we look forward to a memorable event. All challengers of the Hearthstone tournament got seeded into groups of four players, the two best contenders of each group will qualify for the knockout stage of the World Championship. This year's BlizzCon is a real delicacy for every eSports fan, besides Hearthstone there will also be exciting tournaments for Heroes of the Storm, Overwatch, World of Warcraft and Starcraft II. Furthermore each fan can win free Hearthstone packs by participating in the “Choose your Champion” event. So don't miss to turn in on October, 26th when heroes like hunter Rexxar welcome their enemies with the all famous “Let the hunt begin”. More information about the qualifier for the most important Hearthstone tournament can be found right here in our article about the road to the 2016 World Championship. 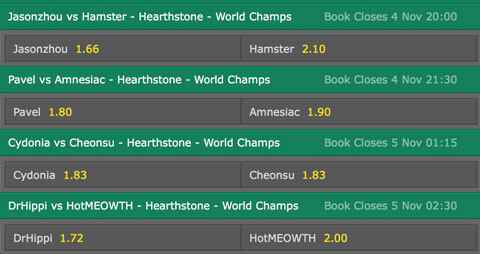 As soon as our well-known online bookmakers for esports will provide betting odds for the most important Hearthstone tournament of the year you will find a comparison of all betting providers right here. Keep always in mind that all the odds shown here might have changed in the meantime. Follow the links to take a look at the latest betting odds. All of the 16 participating players originate either from Europe, America, China or the Asia-Pacific region. Some well-known names can be found between the tough starting field of the tournament, especially Thijs from the Netherlands is regarded as a crowd favourite. You can find an overview of all players divided by their groups right here. The group stage of the 2016 Hearthstone World Championship will take place in double elimination format. Each player who has lost two games in the preliminaries will drop out of the tournament. The two most successful players of each group will qualify for the knockout stage of the World Championship whose matches will be single elimination games. Each duel will be held in the Conquest format. Therefor each player had to announce 5 decks of different classes right before the start of the tournament. Prior to any match each player is allowed to ban one of the decks of his opponent which is restricted to use in the duel. To emerge victorious in the duel you have to win one game with each of your decks. An already victorious deck is not allowed to be used anymore in the ongoing competition, whereas the inferior player is allowed to switch his deck at discretion. This year there are a lot of druid and hunter decks represented in the tournament, each player has one deck of these archetypes. 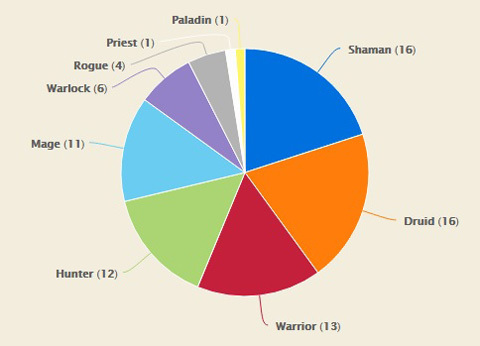 While warrior, hunter and mage decks are also highly coveted, priest and paladin decks are located at the lower end. You can find the deck distribution of the 2016 Hearthstone World Championship right here. At this year's “Choose your Champion” event you can choose a tournament winner right before and after the group stage. Each time this player wins a match at the 2016 Hearthstone World Championship you get a card pack from the card set “The Grand Tournament” for your Battle.net account. Because you get your first card pack simply for registration there is no downside for participating. If you choose your champion correctly you can win the maximum amount of 6 free card packs. To participate in the “Choose your Champion” betting game you only have to follow this link to the official Battle.net website of the betting game. 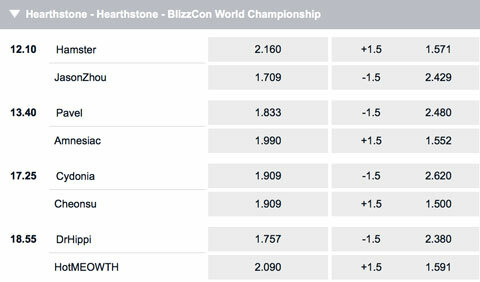 If you take a look at the prize pool of this year's Hearthstone World Championship you will see that Blizzard came down handsomely. Overall there are one million US-Dollars distributed at this event. You can find the specific allocation of prize money right here in this table. As usual there will be a live stream available covering all the games of the 2016 Hearthstone World Championship. You can find the different starting times in our schedule section right above. Furthermore you have the opportunity to watch all matches right here at our website. Just press play to start the stream and tune in into the Hearthstone World Championship. Happy watching!